Draft: 2004, Arizona Diamondbacks, 16th rd. Mark Andrew Reynolds … resides in Glendale, Ariz., in the offseason...He and his wife Kathleen have three sons: Jacob, Reid and Declan... Active in the ziMs Foundation, a charitable organization started by the Nationals' Ryan Zimmerman for multiple sclerosis. Appeared in 86 games with the Nationals after signing a Minor League contract on April 13...Recalled on May 12 and went 3-for-4 with two home runs in his first game with the Nationals on May 13...Also recorded two home runs May 21 vs. San Diego and July 7 vs. Miami, giving him 28 multi-home run games in his career...Named the NL Player of the Week on July 9, after recording a career-high five hits and 10 RBI on July 7 vs. Miami … the 10 RBI matched a single-game Nationals record (also: Anthony Rendon, April 30, 2017 vs. New York-NL)...Hit his second career walk-off home run on July 6 vs. Miami, the third pinch-hit walk-off home run in Nationals history. Played in 140 games for the St. Louis Cardinals and hit .230 (99-for-382) with 21 doubles, two triples, 13 home runs and 48 RBI. His 140 games played were his most in a season since playing in a career-high tying 155 games for the Baltimore Orioles in 2011. Had his best month in August, when he batted .288 (21-for-73) with nine runs, six doubles, three home runs, eight RBIs, five walks and 16 strikeouts. Recorded a season-high, eight-game hitting streak Aug. 23-31, hitting .357 (10-for-28) with four runs, two doubles, two home runs, three RBIs, two walks and five walks and 16 strikeouts over that span. Appeared in 100 games at first base, 22 games at third base, five games in left field, three games as the designated hitter, one game at second base and one game in right field. Struck out 121 times, the lowest strikeout total of his career. Signed as a free agent with Milwaukee on 1/17...Played in 130 games with Milwaukee, starting 72 at first base, 29 at third base and one in right field...Hit 20 home runs for the seventh consecutive season with 22, ranking 18th in the National League...Struck out the fewest times in his career with 122...Homered once every 17.18 at-bats, which would have ranked 4th in the National League, but didn't qualify for the required plate appearances...Posted two multi-home run games (5/23 at MIA & 7/23 vs. CIN)...Tallied a seven-game hit streak from 4/26-5/5, batting .320 (8-25) with 2 HR and 4 RBI during the streak...Hit his third career grand slam, coming on May 21 at ATL off Ervin Santana in the 1st inning...Hit his third career pinch-hit home run, a two-run home run off Kyle Kendrick vs. PHI (7/8). Released by Cleveland on 8/13...Signed as a free agent with New York-AL on 8/16. Played 132 games in his second full season with the O's, hitting 20 +HR for the fifth straight season...Indians hitters who hit only right-handed hit 26HR in 2012 while Mark came in at 23...Ranks 8th in MLB with 164 HR since 2008... He has collected at least 73 walks in each of the last 4 seasons since 2009, one of six players in MLB to accomplish the feat (Zobrist, Votto, C. Pena, Fielder, Dunn). Was on DL, May 11-28, with a strained left oblique for the first time in his career...Began the season at 3B before becoming the O's primary 1B after returning from the DL...Made starts at 1B (105), 3B (15) and DH (12)...Batted .275/.408/.575 with 6HR and 13RBI in 25 games in August. Tied club record w 7HR vs. NYY (R. Hernandez, 2006), including three multi-HR games (8/31, 9/2 & 9/6)...On September 6, he joined Hall of Famer Hank Greenberg (1938 DET) as the only players with three games of 2+ HR vs. NYY in a season..Became the second Oriole to have two games of 2+ HR in a series vs. NYY (Doug DeCinces, May 25 & 27, 1981 at Memorial Stadium)...Became the second player in O's history to have three games of 2+ HR in a four game span against one team, joining Luke Scott (vs. DET 8/17/08-5/29/09, courtesy Elias). In the second half the right-handed hitting first baseman batted .231 (61-264) with 13 2B, 16HR & 46 RBI in 74 games, ranking tied for 8th in the AL in HR and tied for 11th in RBI in the AL after the All-Star break. He hit 9 home runs and drove in 17 runs over a 9-game stretch, August 31-Sept. 8, and banged out 9 HR with 24 RBI during Baltimore's AL Wildcard bid in September...For the year he hit .286 (30-105) with runners in scoring position and recorded the 5th-best fielding pct. among AL first basemen (.995, 108 games, 5E, 971TC)...Collected a .903 OPS and hit 17 of his 23 HR vs. AL East opponents...Set career-highs with 4BB & reaching base safely six times, May 6 @BOS. Played 155 games in first season for O's, his fourth straight season playing in 145 or more ... Finished fourth in the AL with 37 HR, the most for an Oriole since Albert Belle hit 37 in 1999 ... Is one of seven hitters with 30+ HR in each of the last three seasons (also Cabrera, Fielder, Howard, Pujols, Teixeira andUggla) ... Had the third best AB per HR ratio in the AL this season (14.4) ... Is one of eight hitters to draw 75+ walks in each of the last three seasons (also Abreu, Berkman, Dunn, Fielder, Pena, Teixeiraand Zobrist) ... Led the AL with 196 strikeouts, the fourth consecutive season he led his league (2008-2010 with ARI; over 200 in eachseason) ... Also led the league with 31 errors, tied with Ron Hansen (1961) for the third most in a season in club history ... T-14th in the AL with 65 extra-base hits (27-2B, 3B, 37 HR) ... Led the club in HR (37), RBI (86), R (84), BB (75), K (196), and OPS (.806) ... Batted .299/.450/.662 in June and was fourth in the AL in OPS (1.112) ... Had five two home run games; June 11, July 2 and 4, August 7 and September 21 ... Hit second ball in OPACY history into second deck of LF in two home run game on August 7 vs. TOR ... Collected season-high three hits seven times; May 4, June 19, July 19, August 2, 23 and 28 and September 5 ... Hit first career grand slam, June 4 vs. TOR ... Finished a triple shy of the cycle, June 19 @WAS ... Tied career-high with five RBI, August 2 @KC... Homered in three consecutive games twice; July 2-4 and August 24-26 ... HR'd in back-to-back games three times; June 4-5, July 29-30 and September 16-17 ... Batted .176/.294/.421 in 79 home games and .264/.350/.542 in 76 road games ... Home batting average (.176) was the worst in the AL ... Road OPS (.892) ranked 7th in the AL this season ... Batted .289/.377/.638 in 67 wins and .167/.280/.361 in 88 losses ... Hit .300/.385/.700 with 11 RBI in 13 plate appearances with the bases loaded after entering the season with a .120/.238/.200hitter in 63 career PA with the bases loaded (2007-2010) ... Hit .320/.485/.680 in 9 games vs. OAK ... Appeared in 113 games at 3B and 43 games at 1B. Established himself as one of the premier power hitters in the Majors and set career marks with 155 games, 578 at-bats, 98 runs scored, 150 hits, 30 doubles, 44 home runs, 102 RBI, 76 walks and a .543 slugging percentage while posting a career high-tying .349 on-base percentage... Received an eighth-place, ninth-place and 10th-place vote in the NL MVP voting to finish 20th... In club history, his 44 home runs were the second-most in a single season while his 89 career roundtrippers rank fifth...his 25 home runs on the road were the second-highest single-season total behind Luis Gonzalez's 31 road homers in 2001 while his 19 blasts at home tied for the fourth-most in team history with Tony Clark (2005) and Reggie Sanders (2001) behind Gonzalez (26 in 2001), Jay Bell (21 in 1999) and Troy Glaus (20 in 2005)... He is the ninth player since 1954 to post at least a .260 average, 44 home runs, 102 RBI and 24 stolen bases in a season, joining Hank Aaron (Milwaukee Braves in 1963), Ken Griffey Jr. (Mariners in 1999), Barry Bonds (Giants in 1993), Alex Rodriguez (Yankees in 2007), Chipper Jones (Braves in 1999), Jose Canseco (Athletics in 1991), Larry Walker (Rockies in 1997) and Willie Mays (New York Giants in 1955)... He is the 11th player since 1954 with at least 44 home runs and 24 stolen bases in a season, joining Hank Aaron (Milwaukee Braves in 1963), Ken Griffey Jr. (Mariners in 1999), Barry Bonds (Giants in 1993), Alfonso Soriano (Nationals in 2006), Alex Rodriguez (Yankees in 2007), Chipper Jones (Braves in 1999), Jose Canseco (Athletics in 1991, Blue Jays in 1998), Larry Walker (Rockies in 1997) and Willie Mays (New York Giants in 1955)... He is the eighth third baseman since 1954 to hit at least .260 with 44 home runs and 102 RBI, joining Vinny Castilla (Rockies in 1998), Troy Glaus (Anaheim in 2000), Chipper Jones (Atlanta in 1999), Eddie Mathews (Milwaukee Braves in 1953 and 1959), Adrian Beltre (Los Angeles-NL in 2004) and Mike Schmidt (Phillies in 1980)... His 44 home runs and 24 stolen bases equated to a 31.1 Power Speed Number, tops in the Majors... Is the fourth player since 2000 with 40-plus homers and 20-plus steals in a season, joining Alex Rodriguez (2005 with 48 HR, 21 SB; 2007 with 54 HR, 24 SB), Shawn Green (2001 with 49 HR, 20 SB) and Alfonso Soriano (2006 with 46 HR, 41 SB)... His 223 strikeouts set a new Major League record, breaking his previous high of 204 strikeouts from 2008...he also committed 24 errors, second-most in the Majors... Became third player in franchise history to lead team in home runs and stolen bases, joining Devon White, who hit 22 home runs and had 22 stolen bases in 1998, and Eric Byrnes, who accomplished the feat in 2006 with 26 homers and 25 stolen bases... In club history, his 102 RBI and 24 stolen bases ranked as the ninth-most in a single season... From the seventh inning on, led the Majors with 18 home runs and a .636 slugging percentage...over the first six frames, hit 26 home runs (tied for 10th in the Majors) with a .500 slugging percentage... Finished second in ESPN's "Baseball Tonight" Web Gems rankings behind the Nationals' Ryan Zimmerman...Reynolds had 13 Web Gems and led all players with six Web Gems that were rated No. 1... Stole 5 bases in the May 20 doubleheader @ Marlins, including 4 in the first game, matching the franchise single-game record set by Tony Womack on Aug. 3, 2000 vs. Braves... On June 12 vs. Astros, had a career-best 3 doubles and a home run...the 3 doubles matched a franchise record for the 16th time...his 10 total bases were the most in a 9.0-inning game by a D-back in 2009 and the 35th time in club history a D-back has had at least 10 total bases in a 9.0-inning game... Named NL Co-Player of the Week for June 8-14, with the Rockies' Huston Street, after hitting .417 (10-for-24) with 5 doubles, 3 home runs, 9 RBI, a .462 on-base percentage and 1.000 slugging percentage... Hit 8 home runs in July, tying for the third-most in the Majors with Texas' Andruw Jones...tied with Chris Young (2007) for the second-most homers in July in franchise history behind Luis Gonzalez's 9 homers in July 2001... Named NL Player of the Week for Aug. 3-9 after hitting .448 (13-for-29) with 6 runs scored, 1 double, 6 home runs, 10 RBI, a .515 on-base percentage and a 1.103 slugging percentage... Hit a 2-run, pinch-hit homer on April 14 vs. Cardinals, the second pinch homer of his career... Drew a career-high 3 walks on May 9 vs. Nationals and Sept. 6 @ Rockies... Made his first career start at first base on May 10 vs. Nationals... Had a trio of 2-homer games on May 20 @ Marlins (game No. 2), June 25 vs. Texas and Aug. 3 @ Mets... Hit a go-ahead, 3-run homer off Josh Wilson in the top of the 18th inning of a 9-6 victory on June 7 @ Padres... Went 4-for-5 with a career-best and franchise record-tying 3 doubles and career high-tying 5 RBI on June 12 vs. Astros... Hit safely in 14 straight road games from July 2-Aug. 4 at a .393 clip (22-for-56) with 8 home runs, 12 RBI and .443 on-base and .857 slugging percentages...reached base via hit or walk in 20 consecutive road affairs with a .405 average (32-for-79), 13 home runs, 20 RBI and a 1.409 OPS. .. Had a career-high 12-game hitting streak from July 17-28, batting .413 (19-for-46) with 4 home runs, 6 RBI and .481 on-base and .761 slugging percentages... His 11 home runs in 13 games from July 26-Aug. 9 made him one of 11 players in the last 20 years to hit 11 homers in a 13-game span while only four players have hit more home runs-Barry Bonds, 13, May 18-June 1, 2001; Albert Belle, 13, Sept. 15-30, 1995; Mark McGwire, 12, May 16-30, 1998; Sammy Sosa, 12, June 13-25, 1998... Homered in 4 straight games from Aug. 6-9 for the first time in his career... His 11 home runs were the most in August in franchise history... Drew a walk-off, bases-loaded walk in a 4-3 win on Sept. 9 vs. Dodgers...His 44 home runs averaged 415.7 feet, tops among all Major League hitters according to hittrackeronline.com... His homer off of the Phillies' Brad Lidge on July 28 traveled an estimated 481 feet to the patio area of Friday's Front Row in left-center field. It was the second-longest registered home run of the season and the third-longest in Chase Field history behind Richie Sexson's 503-foot blast off of the JumboTron in centerfield on April 26, 2004 and Justin Upton's 484-foot homer into Friday's Front Row on July 6, 2008... Since entering the big leagues on May 16, 2007, leads all NL third basemen in home runs (89) ahead of David Wright (69), Ryan Zimmerman (69), Chipper Jones (59) and Aramis Ramirez (59). His 261 RBI during the same span are second only to Wright (286)... Following the season, was named to The Sporting News' NL All-Star team... Selected as one of five NL finalists for the 2009 All-Star Game Sprint Final Vote for the final roster spot on the NL Team...finished third in the voting behind the Phillies' Shane Victorino, Giants' Pablo Sandoval and ahead of the Dodgers' Matt Kemp and Nationals' Cristian Guzman...in support of Reynolds, his hometown of Virginia Beach, Va. declared July 7 "Vote for Mark Reynolds Day." Collected a team-high 28 home runs and 97 RBI in his first full season in the bigleagues...among National League third basemen, ranked fourth in runs (87) and homeruns and fifth in RBI...Became the 36th player in Major League history to hit at least 25 home runs and drive in95 runs during their rookie or sophomore season at the age of 24 and younger...currentplayers to also accomplish the feat include Ryan Braun (2007-08), Miguel Cabrera (2004),Jorge Cantu (2005), Jeff Francoeur (2006), Nomar Garciaparra (1997), Todd Helton(1998), Albert Pujols (2001-02), Mark Teixeira (2004), Frank Thomas (1991) and DavidWright (2005)...His 28 homers, 97 RBI and 87 runs scored marked only the 21st time in Major Leaguehistory that a NL third baseman collected at least 25 home runs, 95 RBI and 85 runsscored in a season at age 24 or younger...Set a Major League record with 204 strikeouts...also led the Majors with 35 errors tobecome the first player since Minnesota's Zoilo Versailles in 1965 to lead his league inerrors and strikeouts...among National League third basemen, ranked fourth in runs (87)and home runs and fifth in RBI...Got off to a fast start in the first 8 games of the season by batting .344 (11-for-32) with5 home runs and 12 RBI...according to Elias Sports Bureau, became one of 9 playersin Major League history to hit 5 homers by the eighth game of the season during theplayer's rookie or sophomore year...Florida's Miguel Cabrera was the last to accomplishthe feat in 2004 and others include Carlton Fisk, Orlando Cepeda and Eddie Mathews...His 24 RBI in the first month of the season ranked fourth in D-backs history...Reached base safely in a season-high 12 consecutive games from April 11-23...After batting only .182 with 2 doubles during a career-high 79 at-bat homerless streakfrom April 26-May 21, posted a .333 average (21-for-63) with 8 homers, 4 doubles and15 RBI in an 18-game stretch from May 23-June 11...After batting only .182 with 2 doubles during a career-high 79 at-bat homerless streakfrom April 26-May 21, posted a .333 average (21-for-63) with 8 homers, 4 doubles and15 RBI in an 18-game stretch from May 23-June 11...Batted .296 (8-for-27) with 6 runs, 4 doubles and 5 RBI during a career-best-tying 7-gamehitting from Aug. 9-16. Contract purchased from Mobile (AA) on May 16, making his Major League debut that night at Colorado, going 2-for-3 with a 2-run double and a walk...Had 3 hits on May 19 at Pittsburgh, including his first Major League home run, a solo shot off Tom Gorzelanny...Had a career game on May 25 against Houston, going 5-for-5 with 4 RBI, 4 runs scored, a triple, and 2 home runs, including a 447-foot shot off Dave Borkowski in the sixth inning...5 hits tied the franchise record (11 other times), last done by Craig Counsell on Aug. 7, 2005 vs. Colorado...Led the team, batting .342 (26-for-76) in August, collecting a double, a triple, 4 home runs and a team-high 18 RBI...Was 3-for-5 with a double, home run and 5 RBI on Aug. 30 at San Diego...hit a 451 foot home run off Chris Young, the longest home run to leftfield in PETCO Park history...Led the team with a .426 average (23-for-54) in May, adding 5 doubles, 2 triples, 4 home runs and 15 RBI...Hit his first career pinch-hit home run on June 26 against the Dodgers, a 2-run shot in the fourth...Had 5 consecutive multi-hit games from Sept. 17-22, batting .524 (11-for-21) with 2 doubles, 3 home runs and 8 RBI over that stretch...also collected at least 1 RBI in each of those games...Hit a 3-run homer in the top of the eighth on July 18 at Milwaukee to provide the difference in a 5-2 win...Batted .465 (20-for-43) from Aug. 4-17, picking up a hit in 9 of 11 games, including 8 multi-hit games, and 3 consecutive 3-hit games (Aug. 12, 14 & 15) with a triple, 3 homers and 13 RBI...With a strikeout in the fourth inning on Aug. 21 against Milwaukee, he tied the all-time record for strikeouts in consecutive plate appearances by a non-pitcher with 9, it had been done 5 previous times...Held a .951 fielding percentage over 106 games in the infield and 2 games in the outfield for the D-backs. 2007 Postseason highlights: Hit .200 (2-for-10) in 3 NLDS games vs. Chicago, with a home run, RBI and 2 walks...batted .125 (2-for-16) in 4 NLCS games against Colorado, with a home run and RBI. Had an outstanding season between Single-A Advanced Lancaster and Double-A Tennessee, batting .318 (123-for-387)with 25 doubles, 2 triples, 31 home runs and 98 RBI in 106 combined games...Following the season, selected as a CaliforniaLeague postseason All-Star and Baseball America High Class A All-Star...Led D-backs farmhands with 31 round trippers and a.633 slugging percentage...among all minor leaguers, ranked fifth in homers and second in slugging percentage...His 23 homersfor the JetHawks ranked third in the California League...ranked second in RBI and sixth in average in the D-backs' farm system...Saw action at first base, second base, third base, shortstop, leftfield and as a designated hitter...Batted .326 (15-for-46) with 5homers and 11 RBI during a 12-game hit streak from May 19-June 1...Fashioned career-best 18-game hit streak from June 10-July 4 during which he hit .397 (27-for-68) with 5 doubles, 7 homers and 27 RBI...Honored as the Topps California League Playerof the Month for June after hitting safely in 21-of-23 games at a .356 clip (32-for-90) with 6 doubles, 8 home runs and 30 RBI...Placed on temporarily inactive list on Aug. 16 to play for Team USA in the 2006 Americas Olympic Qualifying Event...HelpedTeam USA win the gold medal and a berth in the 2008 Olympics by hitting safely in 5 of 6 games (5 starts) at a .320 clip (8-for-25)with a team-leading 4 homers, 8 RBI and an .800 slugging percentage...Hit a 2-run homer in his first at-bat of the tournament onAug. 28 in a 15-3 rout of Mexico...Had 2 home runs and 4 RBI in a 5-2 win over Puerto Rico on Aug. 29...Hit his team-best fourthhomer in a 12-2 victory over the Dominican Republic on Sept. 1...Played for Scottsdale in the Arizona Fall League and named tothe AFL All-Prospect Team as the designated hitter after ranking second with 26 RBI, third with 57 total bases, tied for fourth with5 home runs, fifth with a .564 slugging percentage, tied for seventh with 33 hits, tied for eighth with 27 games and 7 doubles andtenth with a .327 batting average...Started in leftfield for the East Rising Stars at the inaugural Rising Stars Showcase. Owned the Midwest League's fifth-best ratio with a home run every 22.84 at-bats. 2004: Opened the year with Short Season-A Yakima and was named to the Northwest League's East All-Star squad...Finishedsecond in the loop with 58 runs, third with 32 extra-base hits and fifth with 19 doubles and .517 slugging percentage...Followinga 4-day stint with Single-A South Bend, returned to Yakima and homered in 4 straight games from July 14-17. March 26, 2019 Colorado Rockies selected the contract of 1B Mark Reynolds from Albuquerque Isotopes. 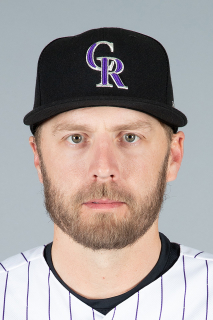 February 2, 2019 1B Mark Reynolds assigned to Albuquerque Isotopes. January 30, 2019 Colorado Rockies signed free agent 1B Mark Reynolds to a minor league contract and invited him to spring training. October 29, 2018 1B Mark Reynolds elected free agency. May 12, 2018 Washington Nationals selected the contract of 1B Mark Reynolds from Syracuse Chiefs. May 1, 2018 LF Mark Reynolds assigned to Syracuse Chiefs from Auburn Doubledays. April 17, 2018 Washington Nationals signed free agent 1B Mark Reynolds to a minor league contract. April 17, 2018 1B Mark Reynolds assigned to Auburn Doubledays. November 2, 2017 1B Mark Reynolds elected free agency. March 26, 2017 Colorado Rockies selected the contract of 1B Mark Reynolds from Albuquerque Isotopes. February 2, 2017 Colorado Rockies signed free agent 1B Mark Reynolds to a minor league contract and invited him to spring training. February 2, 2017 1B Mark Reynolds assigned to Albuquerque Isotopes. November 3, 2016 1B Mark Reynolds elected free agency. August 31, 2016 Colorado Rockies activated 1B Mark Reynolds from the 15-day disabled list. August 12, 2016 Colorado Rockies placed 1B Mark Reynolds on the 15-day disabled list. Broken left hamate bone. December 16, 2015 Colorado Rockies signed free agent 1B Mark Reynolds. November 2, 2015 1B Mark Reynolds elected free agency. December 11, 2014 St. Louis Cardinals signed free agent 1B Mark Reynolds. October 30, 2014 1B Mark Reynolds elected free agency. March 28, 2014 Milwaukee Brewers selected the contract of 1B Mark Reynolds from Nashville Sounds. January 17, 2014 Milwaukee Brewers signed free agent 1B Mark Reynolds to a minor league contract and invited him to spring training. January 17, 2014 1B Mark Reynolds assigned to Nashville Sounds. August 16, 2013 New York Yankees signed free agent 1B Mark Reynolds. August 12, 2013 Cleveland Indians released 3B Mark Reynolds. August 8, 2013 Cleveland Indians designated 3B Mark Reynolds for assignment. December 18, 2012 Cleveland Indians signed free agent 3B Mark Reynolds. November 30, 2012 1B Mark Reynolds elected free agency. November 3, 2012 Mark Reynolds elected free agency. May 28, 2012 Baltimore Orioles activated 1B Mark Reynolds from the 15-day disabled list. May 26, 2012 sent 3B Mark Reynolds on a rehab assignment to Bowie Baysox. May 12, 2012 Baltimore Orioles placed 3B Mark Reynolds on the 15-day disabled list retroactive to May 11, 2012. Strained left oblique.